Years ago, I told you about my spice bowl. You remember, that big glass bowl I stored my collection of spices in for the better part of seven years; the bowl that I was too embarrassed to show to any of my friends, and which filled my kitchen with a thick cloud of nose-tickling spice dust whenever I opened the cupboard it lived in? Yeah, that one. The one that was – despite the inconvenience of never being able to find what I was looking for, and of poorly-closed bags of cinnamon and sesame seeds slowly leaking their contents into the bottom of the bowl, and of frequently opting to buy a new bag of something rather than go through the effort of seeing if I already had it – the best system for storing and organizing spices I could find. The problem was – and still is, as far as I can tell – that people who design spice racks aren’t actually people who cook. If they were, they would certainly know that a measly sixteen or twenty bottles aren’t going to cut it. I mean, I have single recipes that call for that many spices! My bare-bones minimum, the number I couldn’t even think of living without, is probably somewhere around thirty, and once you start adding the esoteric ones – the berbere, sumac and kalonji seeds, for example – well, you can see the problem. I suppose I could have bought three or four spice racks and stacked them side by side, but not only did I not have the space to do that, I didn’t want to financially support those clueless spice rack designers by buying their products in the first place. When we moved back to the US, though, I was determined to find a better solution. I was sick and tired of that stupid bowl, but I was afraid that if I didn’t find a dedicated storage device the problem would just migrate to a drawer or shelf somewhere. My first thought was one of those trendy magnetic racks – you know, a set of clear-top magnetized tins that stick to a sheet of metal on your wall, which in theory can expand to accommodate as many tins as you need – but after nearly fainting dead on the floor of a well-known Seattle kitchenware shop when I looked at the price of one, I decided I was going to have to keep looking. The solution I finally stumbled upon took some lateral thinking, a lot of scouring the internet, and few days of crossing fingers that everything I found would actually fit together, but in the end it is the most utterly perfect spice rack imaginable. And did I mention it only cost a fraction of what a comparable magnetic rack would have? The rack itself is an old printer’s tray from ebay, you know, one of those that used to hold type blocks for the press. The trays come in all shapes and sizes, but the one I was lucky enough to find has fifty-five – count ’em, fifty! five! – uniform rectangular compartments, each of which is just about perfectly proportioned to hold one of these four-ounce square tins. The fit is not exact, of course, and the tins stick out nearly an inch beyond the edge of their compartments, but a little foam tape here and there has filled the major gaps and seems to do a good job of keeping everything snug and tight – snug enough, even, for me to hang the whole thing on the wall, an arm’s length away from the stove, where every night I’m rediscovering the joy of adding pinches and smidgens without needing a half-hour’s advance planning. In fact, it’s working out so well that I’m tempted to open a spice-rack design business myself and start producing them to order. Hmm, do you think there’d be any takers? p.s. Surely I’m not the only one to hit my head against the wall for so long about spice storage – what do you guys do? Oh, Melissa, this is so funny. I just moved back to Budapest (after almost 5 years in Brussels) and had the very same problem with the spice rack+tins. I actually just blogged about it (unfortunately in Hungarian). I took those magnetic tins (but without the rack), they were very cheap in Belgium. Yours are beautiful! I bought a bunch of small glass jars from IKEA and filled them with spices, they fit perfectly in the drawers of my kitchen. I sadly also have a box filled with less used spices and big glass jars of much used spices (like ginger, cinnamon, mustard seeds,etc). I would love to consolidate all in one place neatly labeled. I’ve considered one of those shoe racks on the back of my pantry door, but so far nothing. I love love love your idea. I however do not have any wall space in the kitchen, seriously- none (yep small kitchen). I’d buy it! I used to have a whole mishmash of random bottles stuffed into various drawers and cupboards, but a couple of years ago I found a REALLY pretty spice rack at dean and deluca in NYC which had test tubes of the spices and came with a 1 tsp long metal spoon. It’s got about thirty spices, some of which I never touch, so an assemble-on-my-own rack would probably make a LOT more sense for me, but hey this gets me through the day for now.I love what you’ve done though, and now I’m considering doing the same thing and chucking out my spice rack! I don’t have a rack; I have a spice cupboard. We bought our house from my MIL, and when she lived here, she had two lazy susan turntables in one of the cupboards with her spices. I’ve continued to use that (though not the spices – they were all ancient) and just refill bottles with spices I’ve bought whole and in bulk. I ran out of space on the turntables, and now have bottles and jars stacked completely on the upper shelf as well. Your method is a lot more aesthetically pleasing, though I don’t have any free wall space where I could mimic it (hurray original 1960’s kitchen).I try to buy whole spices when possible; usually from indian or asian grocery stores. I’ll then grind what I can use in 2-3 months and keep the rest in the basement where it’s dark and a bit cooler. I would have purchased your spice rack if it had been around when I did my kitchen remodel! But now I have 3 smallish drawers with spice inserts, kind of like the one here: http://www.kitchenshelves.com/spice_insert.htm(Each insert in my cabinets will hold 24 McCormick-sized jars.) I purchase seasonings and spices from a local bulk food store and refill McCormick glass jars. I got some of the jars from grocery store purchases when I was first married, and many of them from a yard sale. And below my nice, neatly organized drawers, i have the "deep" drawer which holds all overflow – packets I buy on a whim, things that are too big for the 2 oz jar (like a packet of za’atar, or sesame seeds, or…) — kind of the equivalent of your bowl! beautiful rack love the organization!! Your spices are gorgeous. In addition to my cabinet of bags (including about 12 oz. of roasted cumin and a pound of pink Hawaiian salt) and big bottles, I use a rack we made out of an old cassette storage thingy found in the boyfriend’s garage stuff – read about it here if you’d like. It’s nice, because I can use all the weird-shaped jars and bottles I’ve collected here and there. Currently I use:-2 wall mounted acrylic racks that hold 12 bottles each-one of those expandable shelf things that currently has about another 30 bottles currently-a dry erase magnet on my fridge to track bulk items I have to refill the other 50-odd bottles-a dry erase magnet on my fridge to track my dried peppers that are in bags so not out with the bottles. Oh, spices. So tricky! I have a circular rotating spice rack from Crate and Barrel that holds my 16 most used spices on the counter. The others are in a spice cupboard next to my oven. The refills of all my spices are in a paper bag in my pantry and I HATE rifling through it to find what I need. So much so that I often just re-buy what I need rather than trying to find it in there.We lived in London for a year and when we returned home (to Seattle! ), I had to leave every food related item there. I re-bought all my spices at Market Spice and was shocked when they totalled up to over $100! I am a woman who needs her spices! Ah! What a necessary post. I, too, have suffered through years of Spice Bowl Syndrome, and even now I have a few remnants of cinnamon smuggled in from a Provence market, or caraway seeds from Reading Terminal Market in Philly, tucked away in neatly labeled plastic bags that always fall between the tines of our metal spice "rack" (really a drawer-like mechanism that is completely antithetical to any culinary endeavor). In my last abode we kept the spices in a drawer, which seemed like a good idea except whenever we closed said drawer a bit too hard and all the bottles went flying to the back, ruining my preciously, precariously neat order. I found what seemed like a good spice rack on the way to catch the bus home one day, and carted it all the way back with me, and painstakingly painted it, only to find that it did not, in fact, hold spice jars (the openings were too short) but maybe I could use it for, erm, a place to pile the bags? We have bunches of those metal containers on our fridge, but by "bunches" I really mean "eight", which is obviously not enough to do any noticeable damage on my bag collection (and besides, how would I go about prioritizing which eights flavors are lucky enough to earn a place in a tin??). My godmother had a spice rack built into the inside of one of her cabinet doors, which I think is brilliant but still not quite accessible enough for my tastes. I think your idea is brilliant — if you do go into the spice rack business I’ll be your first customer. Hahahaha! I have a spice box, I know exactly how you feel! You have indpired me to at least look for something else! That is fantastic! I use small glass ouzo bottles and keep them in a large cupboard. That’s a great idea. I have a shelf in one of the kitchen cupboards that contains a cake box full of random jars, tins, and packets and then a mess of more frequently used spices that are permanently nearer the front of the cupboard. Your solution looks great but I fear I am too messy for anything to work as a long term solution! Oh please make the spice racks! I dream of having something like that for my spices. My 60+ jars of spices take up the same amount of cupboard space as my everyday plates/bowls/salad plates but in the space closest to the stove. Technically it is in abc order left to right, but it’s not when you have so many. I order everything from Penzeys and use their jars. Then, I re-order what I use most of in bulk and re-use the jars. My husband built spice racks and installed them inside the cupboards. I have four, but I could use at least four more! He based the design on the thingy that hold bibles and hymnals stuck to the back of the pews. He used molding and stained them to match the cupboards. They are each 11 1/2 inches long. Oh…and I keep a large box filled with the bags of bulk spices, salts and dried peppers downstairs in cool/dry storage. What a beautiful spice rack! I especially like the containers because they have wide openings, large enough to fit all types of spoons and measuring devices. Nice way to recycle an old type case, too! What a terrific idea, I am off to see if I can now track one down for myself. Beautiful solution! I have many many spices in a wide assortment of jars and packets that were originally relegated to one shelf, but have spread to two, and are randomly stacked on top of each other. I used to cook a lot, and collected spices from everywhere. My collection makes me a little sad these days, because it’s getting a bit old (and in serious need of a decent storage solution). I’ve got a 4yr old now, and 8month old twins, and find my cooking has become (by necessity) far simpler (and less spicy). Looking forward to revamping my collection one day, and also having the time to break out my cookbooks and devote an afternoon to preparing a feast for a dozen friends. ikea and speciality bottles. my bottles and tins and containers will never match. i have three rubbermaid boxes full of spice bottles/containers. probably close to a hundred plus. a lot of it are spices i purchased when i went to india…they are ayurvedic/medicinal as well as spices. i also have a vast collection of dried herbs(drives the cats crazy…the valerian and catnip boxes stay in the bathroom..did you know that valerian has the same effect as catnip on cats? only problem is that it stinks and it will also attract rats/mice….folk tales say that the pied piper used valerian to drown the rodents!!) and i keep my spices and herbs together. it is a mishmash of kitchen stuff, ingredients for homemade cosmetics and medicinal/ayurveda herbs, roots etc. i am always on the lookout for one of those apothecary type cabinets with personality…..personality being the keyword..love your idea. also…i buy a lot from speciality bottles too! i love how you zeroed in on them as soon as you landed in the states. good call! Gorgeous! I’m in the process of house hunting. As soon as I find a place I’m going to place an order with you! The printer box is brilliant. I currently have a 6’shelf over my work table. Shelf is 4" wide. It holds 6 10" metal baskets with handles (from Ikea for on of their organizing systems). Each basket holds a type of spice-salts, peppers, mixtures, baking, savory, misc. The handle on each basket makes it easy to pull down. Ages ago I bought 2 boxes of small metal containers (originally intended for wedding favors on clearance). I would love to use those tins and your printer box idea. I would be first in line to buy your spice rack. Currently mine is in a mini tierd rack (sort of like the steel kitchen racks you see in restaurants) with bottles and jars lined up. This doesn’t help for spices in packets though. They are just sort of piled up together. Sigh. I need your spice rack! Wow, now that is some organization! Over my lifetime I had ongoing struggles with spice storage and I’ve had many ideas that I’ve tried, spent a fortune on, and then given up. About 15 years ago, I bit the bullet and emptied two kitchen drawers next to the stove that are deep enough to hold spice jars. I no longer rebottle anything or refill — it was too time consuming and the jars were too small — it also helps not to have to clean those reusable jars that seem to attract dust and grease on a rack. I just stand the bottles upright in these two drawers and label the tops,they don’t fly around when I close the drawer because they are full. I keep things that come in bags (sesame seed,sea salt, cinnamon sticks,etc. )in a cabinet right next the stove, neatly bundled into a $1 store plastic shoe box or plastic crate. I also keep extracts in one of those and baking things in another. In fact, I also use square plastic bins with flip lids in my bathroom closet labeled nails, hair, makeup, feet, first aid, cold, etc. Saves tons of time when cleaning the closet and the bottles and containers stay clean AND I can find everything immediately. I have larger bins on the top shelf to hold extra soap, shampoo, conditioner, etc. Nothing stands alone out in the open, so nothing gets pushed back or "lost". I have the neatest closets in America because I’m the laziest housekeeper. I still haven’t solved my spice problem – currently they’re partly on a shelf (and frequently crash onto the cutlery tray due to overcrowding), partly in a show box, and partly in another cupboard – which means that I don’t really know anymore what spices I actually own let alone use all of them…I might need to copy your gorgeous spice rack – unless you do decide to produce and ship to Australia! I’d most likely buy something of that design. I’m tired of having these two plastic baskets of spices all mingling in taste and smell into something strange. Your solution is wonderful, and if you go into business with them, I will be one of your first customers.My own semi-solution is a simple one, and has worked well for me after years of frustration. It only works, though, if you can spare 2 kitchen drawers for the project. Almost every spice I have is laid flat in a glass jar (the one it came in, or an extra, empty one, relabeled), in one layer in a waist level drawer. I can see all the labels, and though rearrangements are sometimes a little figgety to get everything back in after cooking, it is mostly very, very simple.Anything I use alot of, and buy in bulk, is stored in a plastic bag on a shelf, to refill the empty glass jar. This is slightly less convenient. Extra fresh herbs, being dried live in an untidy bowl on top of the fridge. The idea is that after they dry, I should put them in a labeled jar. Ha.It is an imperfect system, but much better than any of my previous arrangements. I agree about the spice rack mfgs. They cannot possibly cook on a regular basis. Melissa, this is amazing!! I agree; spice rack designers don’t use spice racks. I have one rack on my counter, one in the cabinet, and the jars that don’t fit in either place scattered around the kitchen. I LOVE this idea. I’m going on eBay right now. I’m really enjoying your blog! I can’t wait to visit again! How are the tops on your containers? I’m afraid of anything that doesn’t have a screw…if it’s a pull-off top, I would pull too hard and the contents would spill! Velcro on the wall. Velcro on the bottom of your spice tin. Label on the top. Done. Umm, bags and bottles, and jars on a cabinet shelf, and yes they do get everywhere, and whats worse is a bottle of honey leaked in there too. So yeah thats a disgusting mess, hidden behind closed doors. I know I need to do something about it, but I just keep finding better things to do with my time and money. Oh, this has been the bane of my existence for over 13 years. I could never figure out either why there weren’t more options for spices. Spice drawer inserts and turn tables are no solution if you have more then a couple of dozen spices. Yours is a great idea.You actually got me thinking again about this problem. I don’t have wall space after my remodel to do what you did but I have some deep drawers that I can see having layers of spices trays in alphabetical order. I’ll need to do some looking. You didn’t mention where you found the tins, they are very cute, can you share? I wish I had the space for your spice rack. In April I started eating less and cooking more; partially to save money and partially to lose weight. To that end, I now have countless items on my kitchen countertops especially spices. My spice cabinet, which is divded between sweet and savory, is step on mini steps making it fairly easy to see everything. I don’t have any space for anything!. But, I am now inspired to redesign, again, my kitchen island and to include a spice rack. Thanks for your blog, you write beautifully and your photos are terrific. My husband remodeled our kitchen and gave me an island across from the stove. The top drawer is for utensils of all kinds for food prep and the second is for spices, herbs, pre-made rubs/sprinkles, etc. The drawers ar 35 inches wide!! Both drawers are about 3 or 4 inches deep so I can’t lose anything. Then he added wedge-shaped thingies so the bottles and jars tilt a little. I just love that everything is in full view. Should I nominate DH for Man of the Year? Love the spice rack! I’d buy one! Now, where can I find those little square tins? Is it wrong that this post turns me on? My heart is beating a mile a minute. 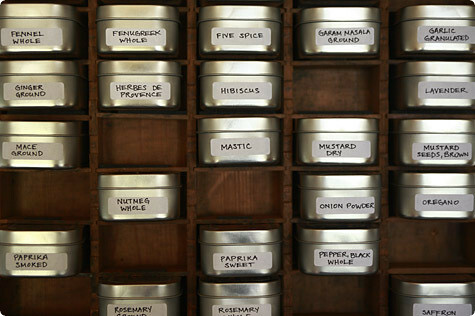 I love love love to be organized, and I have forever tried to figure something out for my spices. I am not really a fan of the "way-to-expensive" magnetic ones. I say for sure go ahead and open up a spice-rack design firm, I will be one of your first customers! Anything would beat my 60+spices that are merely stored in labels (and alphabetized) clear plastic containers. Really great thanks for sharing. I love your solution. I’m in rented accomodation so I can’t stick anything on the walls anyay-so I’ve got my spices in old jam/pesto jars that I soaked to get the labels off. I love finding a pretty jar that I can repurpose for my spices, and I love the look of them all through the glass-so pretty. They’re all on a shelf in my cupboard that’s divided by one of those shelf divider things you buy from organisational shops so I can find them easily. But your system seems more organised, and those printer trays are beautiful. I bought a ton of watchmaker’s cases from Lee Valley Hardware – I forget which size, maybe F? and superglued magnet rounds from HD to the back. The side of my refrigerator is exposed, so they all live there.It’s a nice handy & cheap solution, but yours is prettier. i peak in on your blog often and could not resist commenting this post. i have the sorriest excuse for a spice cupboard–very narrow and tall and shoved into the most awkward corner of my tiny kitchen. i can’t reach into it while the stove is one for fear that i will light the hem of my shirt on fire. i would most definitely be in the market for a usable spice rack. definitely. That is the spice rack of my dreams! Well, maybe I’m just fawning over the sheer size of your spice collection…but that dark wood with the labelled tins is very attractive in itself. I couldn’t agree more. I am not as fortunate (clever? :)) as you are, and have yet to find a solultion to my problem. Your shelving looks visually attractive as well as being completely practical. I can’t begin to tell you how far below par my current storage system is……. My spices are all gathered in a cupboard above my stove. It’s terrible! There’s no fan, so steam rises up and gets in the cupboard and ruins everything. I’ve had ‘reorganize spices’ on my list of things to do since I moved in May. I was thinking of putting them in a drawer with the labels on the lids to keep track of them better. I wish I could put up a spice rack, but there’s no good wall space for it! Yours looks beautiful, though! i store my spices in no order whatsoever above my stove in a cabinet i can barely reach. so collecting one is precarious as i’m usually leaning over the burner or i drop it in the soup. i love your spice rack. and would definitely invest in one. 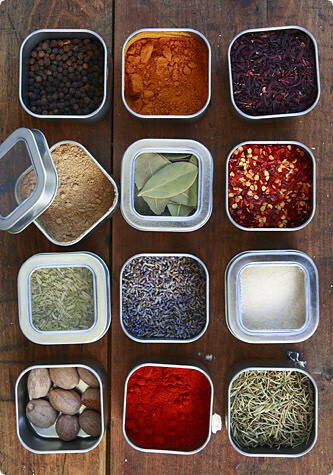 Spice Organization is a MAJOR problem in most kitchens as evidenced by your posting and the number of comments. My family likes to cook AND designed a better spice rack for that exact reason. We came up with the SpiceStack… SpiceStack stores 27 store-bought spice bottles in your kitchen cabinets where they stay dark, dry and fresh. The patented drop-down drawers allow home cooks to easily and quickly find the spice they need while cooking (no more digging through cabinets, bowls, lazy susans, etc.). The current unit sells for $29.95 plus $6.95 S&H but tomorrow we are introducing our new, stackable Spicestack that holds 18 bottles and sells for $24.95 with FREE S&H. The smaller size will allow for people to purchase more SpiceStacks as their spice collection grows. Check it out at SpiceStack.com.I hope this is helpful to some of you out there who are struggling with your spices! Happy Organizing.Lauren Greenwood, President, SpiceStack Inc. I love the spice jars and thin wooden shelf that you get at IKEA. I have 60+ spice bottles. I put the shelves inbetween my top cupboards and the backsplash on the countertop. It doesn’t take up much space, it’s expandable, it’s cheap, and makes me look like an amazing cook! My spice problem is solved… for now. I too am getting more and more into Indian cooking, and it’s swelling my spice collection hugely. I bought 3 sets of stacking spice racks – each one holds 12 spices, and they have a little clicky dial on each container that allows you to empty out 1/4 teaspoon with each click. Saves me the trouble of measuring spices, however I can’t fit any more racks in my kitchen and having more than 36 spices in my collection they’re migrating to cupboards, the pantry, the fridge. I would love to have a beautiful solution like yours. Well come on then young lady, what are you waiting for?! Start the business up and get selling!! Looks like you’ve got your first 65 customers right here in front of you. Well done for solving the perennial and world-wide (I’m sure) problem of the Spice Rack, and thank you for sharing your solution, I’ll be trying to cobble something like this together myself. LOVE your spice rack. I too got those containers at specialty bottle. At first, I loved them. Now though, they infuriate. After a few years of use, they stick and I can’t tell you how frustrating it is to try to wiggle one open without spraying allspice all over the kitchen when it finally comes free. I’m not sure what my replacement solution will be, as they do make for easy organization – I have mine on a couple of lack shelves from ikea mounted just under the cabinets. Wow- cool idea! I really like the looks and how functional it is! I have been looking for such a long time to find an arrangement for under my cabinets- this might work for me too! I think you should sell them- I would pay for one. I like all the offering on the link with the tins, but will I luck out and find a typeset drawer? Hmmm, lots of measuring involved- not my specialty. By the way, I am going to try your cardamom pear butter- it really looks good. Thanks for being so generous with the recipes you find that work well for you. Beautiful solution! My kitchen is super tiny (think of a boat kitchen) so I have an assortment of those tins with magnets stuck on the bottom. My spices are stuck to the side of my fridge. The spices do double duty by adding a nice pop of color and easily accessible. It also frees up cabinet and drawer space. What a beautiful spice rack! Wow. I wish for one like exactly that. I, too, looked into those metallic spice jars after I saw them being used at the Stash Tea Store. $15 for six of them? Eek! My husband had a better idea, so for now I use one of my precious drawers (I only have three) and I used metallic Sharpies to label the black lids of all my jars. They take up half the drawer, so far, and I use the rest of the drawer for measuring cups and other miscellaneous baking tools. (Must move the grater, though–my fingers tell me it’s not a good idea keeping that there, even in the back. )And I love the idea for your spice rack, but I couldn’t put it up in my current apartment. If we get a house, I’d definitely be interested, though! please make one of these for me – I would buy it in an instant! I really like your spice rack. I noticed that your spice tins are metal perhaps, instead of tape in the cubbies you can use magnets? I imagine you would have to replace that tape after some time. If you glued a magnet to the back of the cubbie then it may hold your tin in place for you? I thought it might be helpful. if you were to open a place manufacturing cases like these for this reason, you’d probably do quite well. it’s pretty difficult to find a type case with boxes that are all the same size, and even more difficult to find with boxes wide enough to hold even the smallest spice container. yours is quite beautiful.is there anywhere you’d recommend looking to find type cases similar to yours? I hear you loud and clear. There’s a wonderful farmer’s market near my apartment that has an enormous variety of affordable spices, that I’ve overdone mysrlf a bit. I started out with a lot of spices, and my collection has now grown enough to tack up two racks in a cupboard and a large shelf on the wall. If you did start a business with these, I would definitely make an attempt to procure one. Great idea! A beautiful solution to an age old dilema – congrats!I stumbled across your gorgeous website full of fantastic fun foodie things, and this about the first article I read.It’s reassuring to know I"m not the only one who agonises over the best way of storing spices that statisfies culinary curiosity, practicality, style, and taste.That’s a fantastic idea. I’m yet to find the best solution – currently using an ugly, but practical set from Decor (im in Australia). LIttle plastic clear tubs , about 12 to a tray. I have 4 stacked up and counting!Enjoy your brilliant solution, and thank you for a lovely, stylish and informative site. I just discovered your lovely blog, spice racks are a nightmare! I agree they are definitely not designed by cooks.I have a few Tupperware spice containers and I love them, I will definitely be getting more. For me they need to be big enough to stick a teaspoon in and stack, I hate the small glass jars that make it so hard to measure. I don’t know what to say…..You’re lucky to be able to have the ability to design such a Wonderful spice racks! Especially, knowing that you were able to get a BEAUTIFUL printer tray from eBay with 55 box uniquely designed just for you!!!!!! ARRRRRGGGH! You’re making me jealous! I have just re-organized my spice rack but it is not as wonderful as yours, Not At All….but it does its job for me, right now! Thanks for such an inspiring idea! YES, I absolutely Love and Adore your spice rack! Love this idea, stumbled across this website whilst looking for a Spicy Solution. Let me know if you go into business and stick me down for an order.Lynn – UK. Love the blog! Found you through Apartment Therapy.I was wondering how those tins hold up over time. I bought these from BBB and when I washed them, the seal under the clear lid turned out not to be waterproof. I only noticed when all my spices got ruined due to water stuck under the lid. There's a new product on the market that as far as I can tell is extremely innovative in the spice industry. For any of you that are frequent travelers or outdoor enthusiasts, check out this company Spicy Packets. They have tablespoon-sized, single service packets that are supposed to be fresher than any old spices you'll find on your spice rack. Spices only last for 6 months before they basically have no flavor, but these packets are completely shielded from sunlight and air exposure. They seem like a great, inexpensive gift or product for anyone on the go who wants the best possible spices in the most convenient form. Let me know if you learn anything that I don't know – it seems like a pretty cool idea! If you're tired of storing spices, check out Spicy Packets. They were created to relieve people of problems with convenience, portability, lack of freshness, and other problems that the common spice market doesn't address. You buy just what you need, when you're going to need it. I saw your idea here and went to ebay and found a perfect one for me. It's being shipped today and I can't wait to get it all put together. It's going above my stove on my newly repainted kitchen and it's going to look wonderful. I had been trying to find an alternative spice rack for a while and just couldn't come up with anything I liked. This was a wonderful find… thanks for the inspiration. Most people have room on the side of their refrigerators for something. I bought a bunch of tins (like yours but round and without the clear lid – which exposes the spices to the sun) and made the mistake of getting the kind that pull off rather than twist off. I learned my lesson since my arthritic hands had a hard time pulling off the tops and frequently I ended up with spice all over my kitchen. So, I bought new tins with twist off caps. I then got some magnetic tape from my local craft store (I think it was Michaels) and cut off squares of the magnetic tape and then put them on the back of the tins (they have a peel off paper leaving a sticky side). I then put labels on the front of the tins and then just stuck them to the side of my refrigerator. They look great there and are handy to my stove. Here's where I got my tins: http://www.specialtybottle.com/screwtoptincontainersmi.aspx. I actually really want to do the same thing myself. It's brilliant. But I can't find any cases with equal sized openings. Do you know which one you got? Having just discovered this blog – okay, a few years after it appeared, I would like to thank you for inspiring me right at the time that I was totally fed up with the mixed up spice cupboard that quite frequently suffered mysterious movement behind the closed doors, so when I opened the cupboard I was attacked by more than one flying spice bottle (paprika powder is not easy to clean up!). For Neena and anyone else just stumbling across this and thinking of having a go at something similar, I've found the tins for a very reasonable 3 for $4 at https://www.papertreyink.com/clear-top-tins/ and they ship overseas for a reasonable price – it's not easy to find anything like this in Australia. I haven't been able to find a suitable printers tray, but found some wooden bakery display trays like this http://imgc.classistatic.com/cps/blnc/120923/837r1/6844ekm_20.jpeg that I will glue dowling dividers into, and probably have to put velcro on the backs of the tins to hold in place. I want this option! All of my spices are just in my cupboard because I keep trying to figure out a solution and I can't figure one out 😦 I have like 50 spices!!! Melissa, I think your solution is tops for functionality and elegance! (Next best are velcro and magnet approaches, but they get fewer style points in my judgement.) I've started my own project to create something similar. To anyone looking for printers' trays, I found the best places to look are eBay and Etsy, and good searches are "printers type case" and "printers type drawer". If you dig, you will find some with equal sized compartments, or just two different sizes. (Though if you're creative, you might come up with a way to use variously-sized compartments!) I would also check that the depth of the compartments is at least an inch and a half; less just doesn't seem like it would hold much stably.Wish me luck, and spicy success to all who follow this path!